Joyce Hatto has been identified as the musician on a recording dated 1993, and it was a live recording, moreover. Apparently, Deep Purple's 1993 album Live at the NEC was recorded by Hatto, writes queen mudder. "...the actual recording was a fraud perpetuated by former pianist and sicko con artist Joyce Hatto RIP." More on this story as it develops. Gerard Mortier is indeed going to be the general director of New York City Opera, succeeding Paul Kellogg in 2009. This is incredible news for United States opera: With David Gockley heading San Francisco Opera, Peter Gelb working, reportedly, all sorts of audience-friendly magic at the Metropolitan Opera, James Conlon doing his Recovered Voices project with the LA Opera, and, let's not forget, Bill Mason and Brian Dickie bringing new works and productions to Chicago, the US may be entering a veritable golden age of exciting and provocative opera. Plenty of general directors and music directors at major opera houses now believe and understand that audiences want more than pretty singing, they want even more than pretty people singing prettily; audiences want dynamic productions and direction. One of them must have the guts to put on the Lost Highway/Writing to Vermeer double-bill. Who's it going to be? 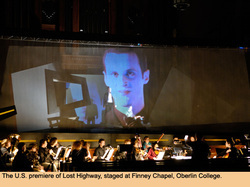 The brilliant Austrian composer Olga Neuwirth finally had another work performed in the US on Friday night when her chamber opera version of the David Lynch-Barry Gifford film Lost Highway opened at Columbia's Miller Theater. That it takes a college group, albeit the everything-but-professional students of the Oberlin Conservatory Contemporary Music Ensemble, to bring her music here smacks of a high-level conspiracy, but it's really not that difficult. Neuwirth trades in Expressionistic alienation and a modernist by inclination, and alienation is a theme that isn't that welcome in contemporary music. Film can get away with it, though, as Lynch has proven over and over, so if it takes students under the spirited leadership of Timothy Weiss and director Jonathon Field to get this music on the stage, that's fine by me. Large swathes of the film's dialogue are incorporated into the libretto, by controversial Austrian novelist Elfriede Jelinek. That dialogue is rarely sung, but instead spoken by actors, and the music of the characters who do sing is written such that supertitles aren't necessary. (Bill Bolcom, are you listening? An Austrian sets English more clearly than you do.) Jelinek rewrote two scenes, one in which Mr. Eddy beats a man for smoking where it's prohibited-in the movie he whips a guy for speeding-and another when Renee first strips for Mr. Eddy. In the opera, she gets to keep her clothes on, and the scene is narrated. Neuwirth's score plays destructive havoc on your senses, always twitching, never letting you relax, much like the film. Lynch's unbearable ominousness and suspense have found a musical analogue through Neuwirth's electronically manipulated speech, song and instrumental effects. One example: There's a party scene early on, and Neuwirth supplies electronic dance music piped through the loudspeakers. Over that, she lays the small orchestra playing tightly focused phrases that register like blips on the radar. Your ear keeps trying to focus on the beat, but gets distracted by the busier elements. That scene achieve musically what Lynch achieves through film editing and, yes, his soundtrack, which is an unsettling feeling that something awful is about to happen to these people. It does, of course, but the tension is never resolved, for in both the opera and the film end with Fred/Pete going through violent contortions as their personalities and identities wage war against each other. There's no easy pay-off here, not even the cautious, haunted reflections of What It All Means that Nixon and China goes through in Act III. Those seeking catharsis should look elsewhere. With many of them making their New York debuts, the young singers and actors must have been fighting some vicious jitters, and, indeed, they did all become more convincing as the opera progressed. But they couldn't match the dread of Neuwirth's score with their acting or singing. I'll speculate that it's a lack of experience and not for lack of effort that the cool assurance of the movie's cast was lacking from last night's. Baritone Michael Weyandt stood out as the persecuted auto-mechanic Pete, singing with a clear high baritone and showing great confidence as an actor. His doppelganger Fred, actor Barry Bryan, sounded oddly detached from his lines. Alice Teyssier took a few scenes to get comfortable, but she became a haunting dual persona as Alice/Renee, the lover of the two guys above. The flights of her light soprano communicated her characters' wounded bird personality well. Raphael Sacks' Mr. Eddy was a stick-thin brute who rages in falsetto and rumbles with even more menace. Such a young actor in the role can't help appearing a little comical, and falls just shy of scaring the bejesus out of the audience. And I hate to say it, but countertenor Chad Grossman's Mystery Man, the creepy apparition in white face paint and garish red lipstick who exists solely to mess with the subconscious, isn't creepy at all, but he does sing well. Yet he'll give no one nightmares. The sets, by Scott Dane Knowles and Giovanni Campo, looked rather flimsy, but these two came up with a novel set of flat panels within that set for the multiple projections and video elements. What this opera needs is another production that isn't constrained by a college music department's budget. (Mark Swed wrote in the LA Times that English National Opera is reportedly producing it next year, and Kairos has released the original 2003 Graz production on CD. [Scroll down.]) The orchestra and singers give stunning performances for musicians of their age, and Oberlin compares exceptionally to the Bloomington and Juilliard ensembles I've heard, but their technique isn't that of a group of pros. They probably haven't been kicked around by life too much, either, and once they have been, they'll be able to appreciate that alienation Neuwirth is so fond of much better. One of the things you're not taught in music school is that before you take a vacation, you have to work ahead so you aren't excessively behind when you return. That upfront work kept me from posting that I'll be going to New York this weekend for the premiere of Melinda Wagner's Trombone Concerto with the New York Philharmonic, in this season of 1,001 trombone concertos; the U.S. premiere of Olga Neuwirth's Lost Highway; and Piotr Anderszewski's recital of Szymanowski and Beethoven. The Brian Blade Fellowship at the Village Vanguard is also in the calendar. This is probably as good a place as any to second a living composer's opinion that Anderszewski looks very similar to John Stamos. To whomever googled cadillac hindemith saxophone, you're looking for Hindemith's opera about a murderer titled Cardillac. As far as I know, there are no Escalades in it. Awhile back, there were news reports that the CIA and FBI were using computer software to analyze people's gaits in an attempt to stop terrorists from blowing up buildings. The argument ran that terrorists tends to walk nervously, hunched over, and in such a way that announced to a detailed computer program that they had a bomb strapped to them. Predicting what sort of music a performer will create based on how they walk onstage doesn't seem quite so outlandish when I remember that our hard-working government has people doing something similiar to ensure the future of western civilization. Keith Jarrett moves from offstage to center stage as easily as walking down the sidewalk, sometimes so at ease that his his hands are stuffed in his pockets. He began his improvised solo concert Saturday night at Orchestra Hall with a breezy chromatic dash that covered all the piano's octaves, softly. This grew into a tightly focused left-hand ostinato, with boppish lines laid on top of it. His second number was gospel waltz, the third a Ligeti-esque tinkler, and the fourth was a simple song. That slow song contained the sadness of a lifetime. Leisurely, pensively, gracefully, that song unfolded, its minor key resolving in the major every so often, the major chords sounding even more wistfully than the minor. His first half closed with another Ligeti-sounding exercise. The days of epic, 45-minute uninterrupted stretches of the solo concerts are gone, I think it's safe to conclude. The concerts that have found their way to commercial recordings, from Tokyo and Carnegie Hall, are broken up into smaller sections of 10 to 15 minutes, and that formula, if it is a formula, prevailed Saturday night. Some listeners were irked by that, some think he's sold out, and while the applause was deafening, it's still clear that not everyone likes this new direction. The first rule of criticism is that you don't criticize something for not being what it is. 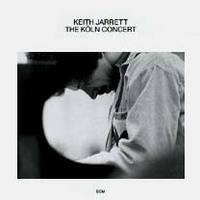 Landscape painters aren't trashed because they aren't Jackson Pollock, Ned Rorem isn't tossed aside for not being Pierre Boulez, and, in this case, Keith Jarrett circa 2007 shouldn't be listened to as if he's Keith Jarrett circa 1975. The sections of Friday night's concert added up to something as powerful as the totality of the Cologne concert, but achieved that in different ways, in different amounts of time. The fourth song from the first half, its bass line descending downward step by step, its atomized melody letting each note be torn from it, had in its power to reduce 2,200 people to silence. That Jarrett did that in five minutes instead of over 45 shouldn't be that important. He pulled that trick off again a few times in the second half, most often in his five encores. An ebullient stride improvisation over rhythm changes did it, as did his last selection, "When I Fall in Love," the only non-improvised portion of the concert. Jarrett 1975 and Jarrett 2007 both moan and sing along and writhe and gyrate at the keyboard, and everyone's got an opinion on whether it's distracting or integral, and I'll take integral. I'm also not put off by his request that no one cough, but just say that if he's concerned enough to make the request, maybe he shouldn't play in Chicago in February. We're all much healthier in spring and summer. One denizen of the upper balcony came down with a coughing fit , and he actually stopped playing, raised his hand, and asked the person to cough once more, because he said he knew there was one more. Once more they coughed, then he picked back up. He finally left the stage with the same droll assurance with which he walked on two hours earlier, but the audience left buzzing. In stark contrast is Jean-Yves Thibaudet, whose birdlike legs appear to cover the ground from the stage door to the piano parked at center stage in two strides. Once there, he's burdened with music that must be released. The collection of six Chopin pieces he began his Sunday afternoon recital with at Orchestra Hall hit the intellectual median of his program, with headier works by Debussy, Messiaen and Liszt on one side and humorous Satie on the other. Through it all, his spidery fingers etched out the fine lines of each differently inspired composer. Most surprising was Liszt's Dante sonata, which Thibaudet brought a booming sound to and no lack of drama or technique apparent. Some may approach achieve a richer tone with the pedal, but he knows his technique and how best to deploy it. I've heard him give a riveting performance of Liszt's Totentanz, but was still pleasantly surprised with the Frenchman's idiomatic exuberance in the Dante sonata. Thibaudet is, of course, one of the most renowned pianists of the French rep. The first and seventh Gnossienes contained revelations in the inner voices, even in the supremely well-known first (which I was heard with a backbeat while in a taxi). His three Debussy etudes were models of clarity, although I would've liked a little more warmth in No. 11, Pour les arpeges composees. But the he ended with a supremely gorgeous final regard from Messian's Vingt Regards sur l'enfant Jesus, the Regard de l'Eglise d'amour. It's almost impossible to convey the release that has accumulated by that regard when the complete, two-hour cycle is performed, but his outsize performance came as close as is possible. If he ever performs the entire work, I'll make sure to attend. He left the stage after his two encores, by Debussy and Shura Cherkassky, as quickly as he arrived, with more pressing matters to attend to elsewhere, it seemed. Oh, and he also did indeed look very gay, as another Chicagoan noticed. Jessica Duchen seconds the report from Gramophone of faked recordings by pianist Joyce Hatto. The pianist none had heard of fooled many critics—I've not heard her discs—and sent them into paroxysms of glee. A random sampling of her recordings turn out to be slightly tinkered-with albums by Lászlo Simon, Yefim Bronfman, and Minoru Nojima. Pristine Classics drops a dime on Hatto here, with mp3 examples. The site explains how some tracks were manipulated, and others which apparently weren't touched at all, such as Bronfman's Rachmaninoff 3. Out of thin air. Keith Jarrett plays a solo concert this Saturday. Elbio grease. Time Out Chicago, Feb. 15, 2007. Elbio Barilari bravely steers his group of Latino composers. Wellness bonus: Heaven in Seven. Go check out the Dame Myra Hess series on Wednesdays.